1. Is Internship/Industrial training/Industrial visit mandatory in B.Tech Programme? A.No. But KTU encourages internship/industrial training. The students doing Internship/Industrial training will get activity points. 2. Is educational tour mandatory for Engineering? 3.Is there provision for improving marks/grade in any course for which the student get pass grade? A.No. Improvement of marks/grades is not possible in courses where one gets a ‘pass’ grade or higher grade. 4.Is matriculation/eligibility certificate required for admission in this university? A.There is no need to obtain Eligibility/ Equivalency/ Matriculation Certificates for admission. 5.What is open book examination? A.Students are permitted to bring in class notes, own notes, text books and other books (Maximum 3/4 books) for the test. Access to internet and mobile phones is NOT permitted. 6.Does the University award ranks for each branch? 7.If a student breaks study and continues after one academic year and meanwhile the curriculum is changed, shall he/she register for courses in the previous curriculum or changed curriculum? A.The Curriculum Committee of the University will suggest the equivalent courses to be studied. 8.How many choices will be available in questions for end semester exam? A.It will vary for different subjects. This will be available in the question paper pattern. 9.Will the University publish model question papers or question paper pattern? A.Question paper pattern will be published. 10.Can a student skip some courses during regular semester and register in subsequent semester? A.Yes, except in semesters 1 & 2. In any case, the maximum duration for completion of the B.Tech programme is 6 years. 11.Will the University issue mark details on request? A.The University will issue grade cards only. The conversion formula from GPA to Percentage is available in the Application (app.ktustudents.in→Download-Install→Student Corner →SGPA-CGPA Finder). 12.How many chances will a student get to pass a course? 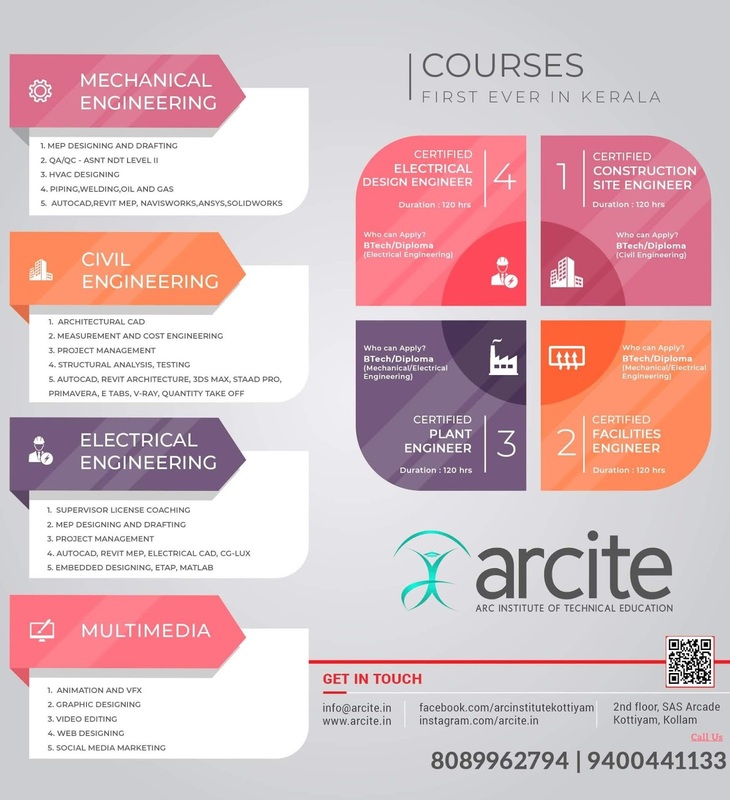 A.The maximum duration for completion of the B.Tech program is 6 years. The number of chances possible within this duration is the maximum a student can get to pass a course. 13.If a student fails in the end semester exam, will his/her internal evaluation marks be regulated in line with the end semester exam marks? A.No. It will be done when the student gets pass marks in the supplementary examination. 14.Who will award Student Activity Points? A.The faculty advisor awards the Student Activity Points. This needs to be entered by the Senior Staff advisor into the KTU e-Gov Portal(Click Here). 15.Can a student break his/her study? A.A student may break study for a maximum duration of two semesters, preferably in one academic year, to initiate start-up ventures, product development etc. This is however permitted only on successfully completing the courses listed out in the first four semesters. Request for this with ample evidence to the seriousness of the venture should be forwarded to the college principal for approval. Break of study on serious health reasons is also permitted with the approval of the college Principal. All such cases of break of study are to be reported to the University and approval obtained. In both the cases, the maximum duration for completing the B. Tech. programme will still be twelve semesters. 16.How can one remit exam fee? A.Exam fee has to be remitted at the college by the student. College can make the fee payment online for all the registered students through the KTU e-Gov Portal. 17.How can exam registration and enrolment of courses be done? A.Exam Registration and enrolment of courses is done as a single process through the KTU e-Gov Portal. Students need to choose the courses from their login, print the registration slip and make the fee payment at the college. College will do the final submission and online fee payment through the portal.Video Tutorial-Click Here. A.It is mandatory for students to register for the courses they want to attend in a semester. Students admitted freshly to the first semester, are advised to register for all courses listed for the semester. They have to enrol for these courses at the beginning of the new semester, based on the previous semester results. Before enrolment, students should clear all dues including any fees to be paid and should not have any disciplinary issues pending. The dates for registration will be given in the academic calendar. Any late registration or enrolment, allowed up to 7 working days from the stipulated date, will attract a late fee. A student can withdraw from a course or substitute one already registered by another on valid reasons with the approval of the faculty advisor. However this has to be done within seven working days from the commencement of the semester. The maximum number of credits a student can register in a semester is limited to 28. 19.How is performance in Practical Course assessed? A.As per the B.Tech ordinance, the scheme of evaluation for laboratory/ Practical/workshop courses is as follows. (iii) Modified as Practical examination internally conducted by the college out of 30 marks (25 marks for practical examination and 5 marks for the Viva). The practical Examination shall be conducted as per the schedule in the academic calendar with two examiners (need not be faculty member engaging the practical classes) from the department. There is no need of writing fair records only. One record is needed which is to be written in the lab class itself after the completion of the experiments. No pre-printed records shall be used. Regarding Design and Drafting labs, the end semester examination shall be on CADD if otherwise specified in the syllabus. A.The summer courses shall be considered as independent courses and students have to register for these. This provision of summer courses may be extended to students who have got FE grade due to (i) shortage of attendance (ie. having attendance less than 75%) and (ii) shortage of internal evaluation marks (ie. having IA marks less than 45%) with the following conditions. (i) The students shall have minimum 50% attendance in the specified course of the regular semester. They have to register for the summer course and obtain 75% attendance. (ii) The students shall have a minimum 35% IA marks in the regular semester. During the summer course the student will get a chance to improve the IA marks by writing one IA make up test during the summer course. This will replace the lower of the two marks got in the regular semester. However the IA marks shall be limited to 50%. 21.What is meant by Pre-requisite Course? A.Pre-requisite course means a course in a lower semester a student have undergone to make him eligible to register for a course in the higher semester. The student shall attain at least F grade in pre-requisite courses for registering to courses in higher semester for which pre-requisite course is mentioned. 22.Is Condonation of attendance given in KTU? A.Attendance is marked for each course. In the case of B.Tech, while 75% attendance is mandatory for writing the end semester examination in that course, students are expected to have 100% attendance. However, under unavoidable circumstances students are permitted to take leave. Leave is normally sanctioned for any approved activity taken up by students outside the college covering sports and other extracurricular activities. Leave is also permitted on medical grounds or on personal exigencies. Leave of absence for all these is limited to 25% of the academic contact hours for the course. In case of long illness or major personal tragedies/contingencies, the College Principal can relax the minimum attendance requirement to 60%, to write the end semester examination. This is permitted for one or more courses registered in the semester. However this concession is applicable only to any two semesters during the entire programme. In the case of prolonged illness, break of study is permitted. 23.What is the criterion for Promotion to higher semesters in B.Tech degree programme? 24.What is the procedure for getting Migration Certificate/Cancellation memo? A.The student shall approach the College Principal for Migration Certificate/ Cancellation memo. The College Principal has to submit online request to University by attaching TC and request letter through KTU portal. If everything is in order and the student has no dues, the University will approve the request, After approval the principal can download the certificates through his login and issue it to the student. If there are fee dues, the Principal needs to pay the pending fee online and then apply. 25.When/How does one apply for Inter College Transfer, Branch Change or Readmission from Other Universities? A.The schedule will be published every year in the 1st week of June in the University website. Norms are available in KTU website. 26.How can discontinued students enrolled in other Universities in Kerala continue their studies? A.Students who discontinued their studies in other universities can continue the studies according to readmission norms. Norms for Readmission is available in KTU website. 27.Is Branch Change possible in KTU? A.Branch change is permitted before registering to Third semester for B.Tech Courses. Norms for Branch Change is available in the KTU website.Read More Rules-Click Here. 28.Is Inter College Transfer allowed in KTU? A.Inter college transfer is permitted to Third Semester & Fifth Semester for B.Tech and B.Arch courses. Norms and Proforma for Inter College Transfer is available in the KTU website.Click Here. A.Academic Calendar gives dates of Commencement and termination of Classes and schedule of all academic & Co-Curricular activities. Academic Calendar is available in KTU website. 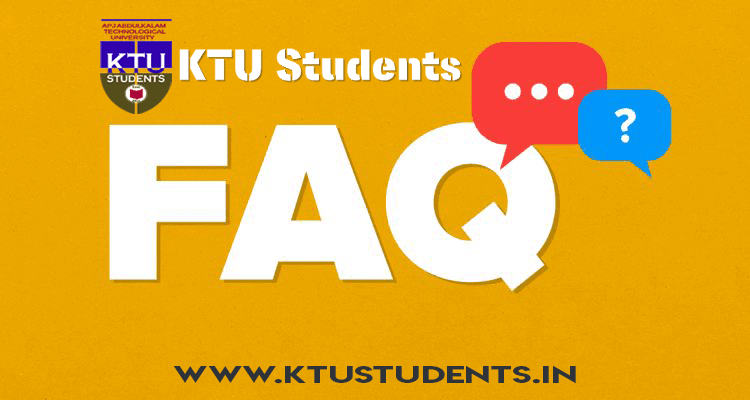 APJ Abdul Kalam Technological University KTU Frequently Students Asked Questions and Doubts and Its Answers .KTU Frequently Asked Questions-FAQ.Have a question? You can find the answers for the most common questions asked by Engineering Students From Different Colleges.